In the ever-changing world of continuous improvement, we must always remember to walk our own walk. 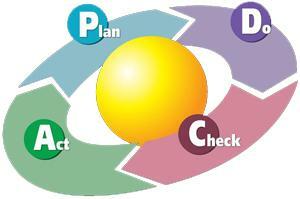 If we, as continuous improvement leaders, are teaching and coaching people in the plan-do-check-act (PDCA) process, we too must ensure that we are leading by example. We must not vary our process from this cycle of improvement that works so very well. Too many companies get so focused on the DCA part of the equation that planning is completely left out or is at best an afterthought. We do, check, act, do, check, act over and over again so many times that we are working really hard in several different directions. Instead, I challenge you to be very deliberate in your planning process. Since I am focused on continuous improvement, I am writing this note from that perspective. What exactly do you want to accomplish through the application of continuous improvement? While that is a pretty broad subject, consider each of the following topics: quality, cost, delivery, safety, morale and growth. Thinking as specific as you can, lay out quantifiable goals for each of these topics so that the organization has a clear signpost to follow, as well as a quantifiable progress report for the fiscal year you are confronting. Most of this is clear if you go through an enterprise-level value stream map. If that is not the model you follow, at least spend time with the continuous improvement process to define where you are trying to take the organization. Once you have determined your high-level goals for each of these topics, then you can set out with the tactical plan for how to accomplish those goals using Pareto analysis, value stream maps and other tools. The point is to define where you want to go before you embark on the trip. As someone once told me, "If you don't know where you are trying to go, the best map in the world won't help you much."